Bob Crane’s 3D model carousel design was based on “Jane’s Carousel” in Brooklyn, N.Y. In this high-tech, fast paced world where online games and entertainment offer instant gratification, it is refreshing to find a group of skilled craftsman who still carry on the traditions of hand-cut wooden jigsaw puzzles. But make no mistake. Today’s top of the line jigsaw puzzles are not the simply constructed puzzles your grandparents played with. Nosiree. 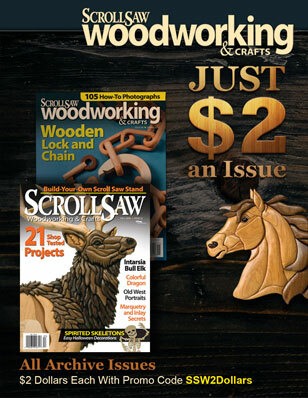 These puzzles combine old fashioned charm with mind-boggling techniques and outrageous cuts designed to challenge and even astound. Here is an overview of some cutting edge puzzle artists who are redefining the art of puzzle making. 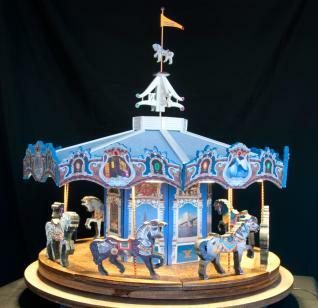 This 24” high by 18” wide 3D model carousel design was based on “Jane’s Carousel” in Brooklyn, N.Y. The model consists of 48 puzzles (1,423 pieces in all) with 661 handset Swarovski crystals and eight micro LED light units on the interior ceiling of the carousel. The eight “Stander” type carousel horses are magnetic puzzles. The front horse is a puzzle, while the rear horse is solid (not cut). The polished brass pole is drilled through the rear horse and wrapped with a pin stripping tape to simulate a carousel pole. Each horse has a small piece of steel on the bottom hooves, to attach to magnets in the floor panels. The 8 floor panels and fabric covered roof sections were cut from poplar as tray puzzles. Black Cat Magic is an example of Andrea Farnham’s two-way puzzle designs. 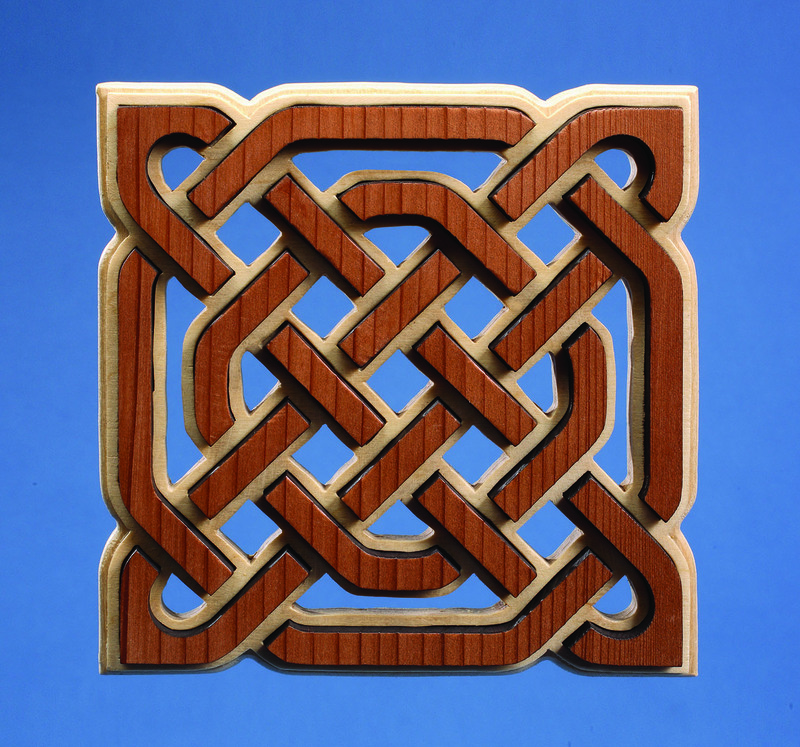 The puzzle was cut from custom-made 1/4″-thick plywood with a cherry veneer backing. The print was mounted on the wood and a semi-matte laminate was applied before cutting. It measures 6-11/16”- diameter and has about 70 pieces. In the first view, the cat is looking for his catnip mouse located directly behind him on the rug. But by rearranging some of the pieces, the puzzle can also be assembled so that the cat grabs the mouse with his paws. The challenge is to assemble the puzzle both ways. It Takes a VIllage is an original design by Shawn Ferguson that reflects the motto that it takes the support of a community to raise a child. This technically complex puzzle utilizes four individual levels of depth. It was cut from premium formaldehyde-free PureBond mahogany plywood, and has 191 pieces. It measures 11″ by 14″ and is fully interlocking. The scene was etched with colored pencils to look like and elementary school drawing. The puzzle was donated and auctioned off to help raise money for a local school. For more of Shawn’s work, visit www.fergusonpuzzles.com. The Test, one of Chris Yates’ most challenging puzzles, consists of five bases, each with five layers adding up to 1,239 pieces total. It took about two solid weeks to create, and four full days of serious attention from the expert Baffler Assembly Team to put back together. The puzzle was completely hand cut on scroll saws from 1/4”-thick medium density fiberboard then hand painted. The central base is 1-1/2″ by 13-1/2″ by 13-1/2″ and the cardinal bases are 1-1/2″ by 6-1/2″ by 6-1/2″. For more of Chris’ work, visit www.chrisyates.net. Jay Hollis started his company after a chance encounter with famed puzzle maker, the late Pagey Elliott. “We met at a craft show and she invited me back to her home to talk about puzzles. I’ve been hooked ever since.” Trained as an architect, Jay pours his extraordinary visual sense, keen attention to graphic design, and unwavering commitment to perfection into each puzzle creation. Bogarts puzzles was selected from among 1,300 applicants to display their jigsaw puzzles at the 2010 Smithsonian Craft Show, at the National Building Museum in Washington D.C. one of the most prestigious venues in the country. Chips features delightful pop up figural pieces along with a series of layered segments and layered whimsies. Measuring 10″ by 10″ and consisting of 250 pieces, this puzzle is constructed from 1/4″-thick furniture-grade 5-ply cherry plywood. The image of Chips has been laminated onto the front surface of the puzzle. The back of the puzzle is cherry veneer brushed with three coats of tung oil. The layered portions of the puzzle actually protrude 1/8″ above the surface of the puzzle itself. A secondary puzzle constructed out of figured ebony can be found beneath the layered portion of the puzzle. The three geese in flight were carefully articulated showing wing and tail feathers, and painted a contrasting gloss white. For more of Jay’s work, visit www.bogartswoodenjigsawpuzzles.com. A good example of John’s work is The Garden of Earthly Delights, by Hieronymus Bosch (© Museo Nacional del Prado – Madrid Spain). This puzzle measures 56 1/4″ by 30″ (prior to cutting) and consists of 4,271 pieces. The paper used was Ilford Gallerie Smooth Pearl Paper, the image was printed on an Epson 7600. John used OCB Reprographics (now “Arc”) to mount the prints using a mounting film and a large roller press. The wood was a 5-ply ApplePly with maple on the front and back with three layers of birch inside. The puzzle is divided into three panels. The left panel was cut in “Swirl Curl”-style, the center panel was cut in “Long Round”-style, and the right panel was cut in the “Creative”-style. The puzzle sold on eBay for $25,100. For more of John’s work, visit www.custompuzzlecraft.com. Homers the Odyssey is an epic adventure for the puzzler. You take on the charter of our brave Odysseus, after the war in Troy, you climb from the Trojan horse to make your way home, and so your journey begins. You will encounter ogres and giants, witches and monsters all trying to keep you from your beloved Penelope and Telemachus. This puzzle has two layers and sometimes three pop ups, Dee-lightful and Dee-spicable (goes together more than one way) puzzles, tray slide puzzles and a three layer stand up Trojan horse. A guide book and a gadget box and a copy of the Odyssey will help you solve some of the puzzles that lie within the larger puzzles. It will it take you 10 years to make your way through the puzzle, but fear not, it even it took Odysseus ten years to make it home. Steve and Dee offer clues theywill trade for M&Ms. This puzzles measure 29” by 57”. The bottom layer is the map of the Mediterranean. The second layer is puzzles of places Odysseus visited. For more of Steve and Dee’s work, visit www.platinumpuzzles.com. Steve Malavolta’s puzzles range from single layer entertainment pieces to multi-layered sculptural creations. His designs include landscapes, abstracts, geometrics, and 3-dimminsional architectural forms created for both visual pleasure and intellectual challenges. Each inlaid piece is hand-cut from exotic hardwoods on a scroll saw with a jeweler’s blade, and finished on both sides. He uses a standard shaped puzzle piece with a well-defined lobe and socket on each side locking it to another piece. “My goal as a woodworker is to create an enjoyable, playable piece of heirloom quality . . . and my challenge to you is to find peace by piece.” he said. Pyramidal 551 is an example of Steve’s 3-D sculptural puzzles. Cut from quality wenge wood (African Rosewood) with sterling silver, it measures 10” by 10” by 12”. The sculpture contains 551 pieces stacked in 36 perfectly balanced layers. Cradle of Piece consists of 14 layers precisely cut from wenge and maple with 350 pieces in all. It measures 10” by 6” by 6” and comes with a glass cover. For more of Steve’s work, visit www.stevemalavolta.com. Melinda Shebell first pieced together puzzles with her grandmother when she wasn’t much taller than a card table. With a high-tech career winding down, and time for puzzles again, she discovered the wonderful wooden puzzles of the past. “Being an engineer at heart, I started to create some of my own,” she said. Melinda sold her first puzzle in 2000. Today Jardin Puzzles are well-known for quality hand-cut craftsmanship, a highly skilled use of multiple cutting styles, and compelling artistic beauty. Exchanging Flowers is a limited edition puzzle made for the 2012 Pagey Elliott Puzzle Exchange. About 7″ by 13″ and 100 pieces, it was cut from 1/4″ thick five-layer plywood with a hand-finished mahogany back. The puzzle can be assembled as two separate one-layer puzzles, a double layer puzzle, or one large single layer puzzle. Deception is woven into the artwork where a novel leafy cutting style, combined with the use of key dropouts, make it possible to assemble this puzzle in thousands of incorrect ways. Not aiming for complete frustration, the design combines two levels of difficulty. Sections are mildly challenging to solve. Rearranging sections for a given solution is much more difficult. Most layered puzzles consist either of entire layers of different thicknesses or key pieces glued together to anchor the layers. But, Exchanging Flowers 2 uses unique hidden positioning pieces to hold the top layer in place. For more of Melinda’s work, visit www.jardinpuzzles.com. Back-to-Back Butterflies is a tricky two-sided puzzle was especially created for die-hard puzzle enthusiasts. It consists of 225 pieces and measures 10” by 12” with the identical butterfly image on both front and back so puzzlers won’t know which side is which. 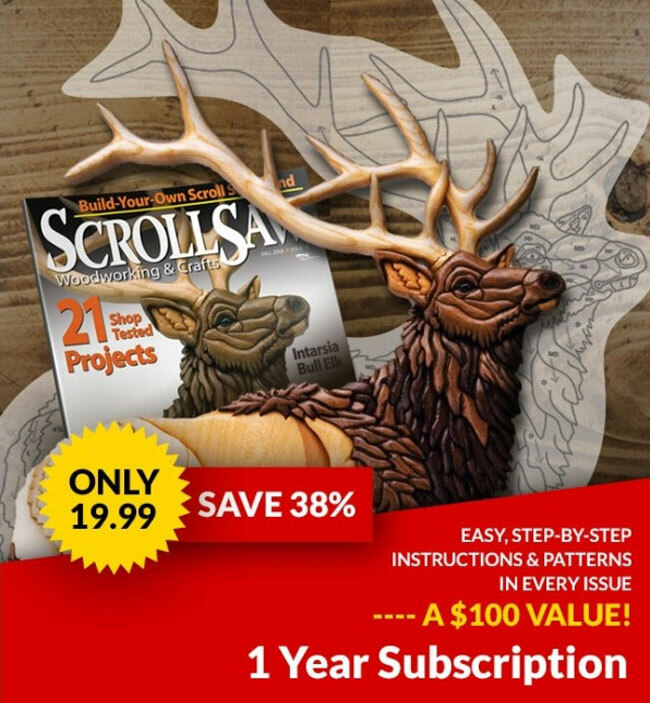 It is all hand cut on a scroll saw from 1/4″-thick solid basswood. The entire puzzle interlocks and holds together once assembled. As with all Fool’s Gold Puzzles, you’re on your own—no pictures are included. For more of David’s work, visit www.foolsgoldpuzzles.com.